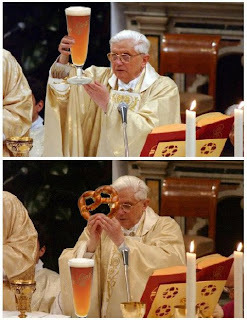 This was sent to me and maybe it's sacrilegious ... but it was too funny for this raised-Catholic not to repost! Pretzel logic post #1 is, actually, about pretzels! It was a whirlwind tour! Thursday afternoon, drive to South Carolina to work in Greenville all day Friday. Barley's bartender doesn't waste a drop of the Loose Cannon cask! Friday evening, introduce the state to cask Loose Cannon Hop3 Ale, in Greenville, South Carolina, at Barley's Taproom and Pizzeria. Then Saturday - very early Saturday morning - drive back to Gaithersburg, Maryland in time for the noon start of the Wine Tasting Festival at Finewine.com where Clipper City's were the only beers to be poured, among many wines. The city of Greenville is in the northwestern quadrant of South Carolina, and is only an hour's drive from Asheville, North Carolina and the Great Smoky Mountains. The South Carolina government just recently amended its regulations to allow high gravity beer importation and production. And Barley's, a Greenville restaurant and beer bar, is one of those at the forefront of the brand-new high-gravity beer explosion in South Carolina. They have quite an impressive draft array of good beers, - high gravity and not - both in their upstairs bar and the downstairs dining area. High gravity refers to beers of more than 5.9% alcohol by volume (or at whatever level a state government might peg that). When a craft brewery produces a higher alcohol beer, it mashes larger than normal amounts of barley - the grain that gives beer its flavor and fermentable starches - thus increasing flavor as the alcohol increases. Whereas mega-breweries create their higher alcohol beers - usually insipidly sweet malt liquors - by mashing-in, not with barley, but with prodigious amounts of corn or rice. Both are much cheaper grains, and impart little flavor to the finished beer. Thus with malt liquor, mega-breweries can increase alcohol content without adding flavor, and without incurring significantly higher costs. Cask ale is living beer - yeast still working inside the firkin (an English stainless steel cask holding 10.8 US gallons). So, wanting the beer to be in its freshest state, I drove the cask down in my car. The trade-off was that the beer didn't have a day or so to rest in Barley's beer cooler and settle down. So we swathed the cask's topside bung with bar towels. When I tapped the firkin, the towels caught the fountain of fresh beer that erupted. But no worries: things calmed down quickly, and the beer was superbly fresh. Clipper City's cask of Loose Cannon Hop3 Ale was only the third cask ever tapped at Barley's. Casks are slated to become a regular Friday event, anointed Firkin Friday. Proprietor Josh Beeby and bar manager Drew Moren also discussed with me their plans for eventually adding a beer engine and daily casks. 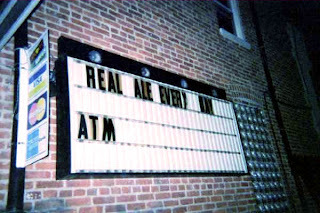 That evening, I met several Loose Cannon and Clipper City beer fans, who expressed their pleasure that they could now buy the beer in town, rather than driving to Asheville, North Carolina, or Athens, Georgia. It was quite gratifying, especially being so far afield for me and Clipper City. Carolina rep Chris Woke, Barley's Manager Drew Moren. After the cask was drained - within the hour! - I went downstairs to the now packed dining room (with a line snaking out the front door) and enjoyed a pizza pie (after all, it is Barley's Taproom and Pizzeria) with the owner and rep from my new South Carolina distributor - Carolina Craft Distributing. More photos from Friday's cask tapping. 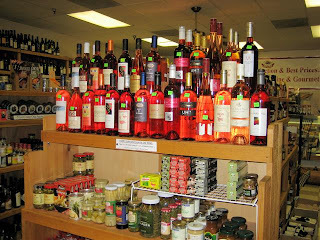 D.C. wine lovers ... that would be fans of wine who reside in the greater Washington, D.C. area. 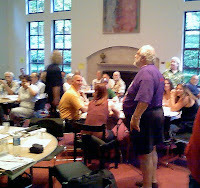 Tuesday evening, I - Territory Manager for Clipper City Brewing Company - and Michael Kiss - cheesemonger at Whole Foods Arlington, VA - hosted a beer and cheese tasting for 70+ members of the Washington Wine and Cheese Society, at their monthly meeting place at Saint Patrick's Episcopal Church in NW Washington, D.C. We had been invited by Tony Guida (pictured), president of the society. I introduced each Clipper City beer - its story and its flavors - and then introduced the complementary beers. Michael did the same for the the cheeses. We then discussed the pairings, and why we thought they would work. There were 5 flights. For each flight, participants received 2-3 ounce pourings of each Clipper City beer, and the same pour-size for one of the two complementary beers - similar in style to the Clipper City beer. 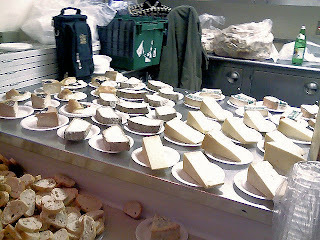 To ease logistics, the cheeses were served all at once. For the most part, the participants were patient and played along, waiting for each beer before sampling the paired cheese. It was a typical Washington D.C. night - hot, humid, and close, and the kitchen refrigerator couldn't handle it. The beers of first 2 flights were served near room temperature. We iced down the remaining beers. called a pin, which contains 5.4 US gallons. The Loose Cannon Hop3 Ale was special treat, and a surprise for many participants. 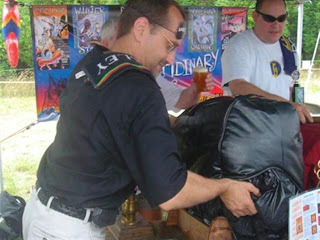 It was served fresh: not from a keg but from a cask, that is, the beer was living beer, still fermenting in the vessel. And that is as fresh as a beer can be. It was gratifying to have several wine-drinkers approach me afterwards to say that they had never tasted beer of that character. Most beers - if well made to begin with! - will show better when served fresh from casks. All the cheeses and bread were purchased at the Whole Foods, Arlington. 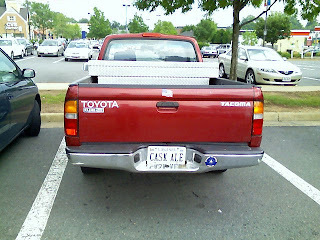 All the beers were purchased - and are available - at the Bethesda Market (301) 229-8068, in the Sumner Place Shopping Center. DC Beer, the on-line discussion group for good beer in the DC/Baltimore/Richmond area, is temporarily off-line. Brauhaus.org has suffered a disk failure. I am working to restore from backups. Please expect that things may take a bit of time to fully get back online. Dan. Driving my territory docket does not always provide relaxing moments: 11 hour car trips for example - thank goodness for audio books. But when traveling across the Potomac River from western Montgomery County Maryland into northwestern Virginia, I can enjoy a treat. 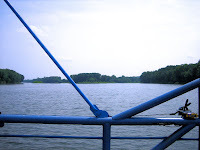 It's a car ferry from White's Ferry to Leesburg ... and on a long, hot, humid, and frustrating day, that 5 minute river voyage can be quite the anodyne. Tom Sietsma gives Brasserie Beck - DC's newest Belgian-inspired restaurant - a good review in Sunday's Washington Post Magazine. And a nice mention of the beer therein! "The beer list", announces the waiter as he sets a thick black book on the able. If you ask, you can have a consultation with the house specialist, Bill Catron. Take advantage of his service. Catron has assembled 80 or so first-class brews, and he and his staff talk them up with a reverence typically associated with sommeliers. If you don't usually drink beer, chance are you'll be a convert when you leave. If you're a devotee, you'll be in brew heaven. I took special notice of Sietsma's mention of the double-fried "french fries" (Sietsma should have called them Belgian-style frites) and the beef stew made with Chimay, a Trappist ale. 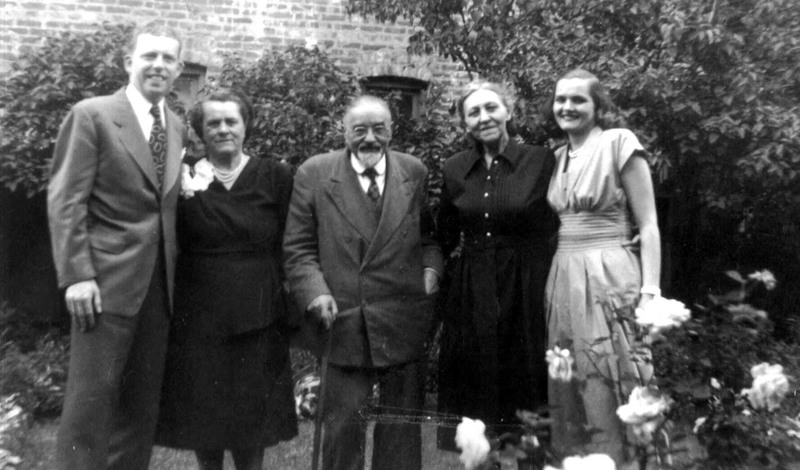 As he did with Marcel's, Wiedmaier named his second restaurant after a son. Beck is both another chip off the old block and a fizzy [emphasis mine] addition to the city. Would Sietsma say of a wine-centric restaurant: "a flat addition" (as in no bubbles)? But all in all, it's a positive and spot-on review. Save up, and go! Last evening, the night was clean, clear, and with a breeze, a beautiful June rarity in normally muggy D.C. A friend chose the evening to introduce me to the music of Cape Verdean singer Cesária Évora at Wolf Trap Center for the Performing Arts. [Evora] is known as the 'barefoot diva' because of her propensity to appear on stage in her bare feet in support of the homeless and poor women and children of [Cape Verde]. There's a strong feeling of cultural melange (even hints of Eastern European) mixed into her music ... occasionally I felt as if I could have danced the polka, that is, if if I had added more hip movement! And there's an intimacy implied by her mournful tunes, something the amplification didn't fully allow. Évora has a powerful yet- paradoxically - intimate alto-timbered voice. The opening act was Brazilian Seu Jorge, who performed accompanied only with his guitar. I first heard Jorge in Wes Anderson and Bill Murray's (almost) brilliant movie The Life Aquatic with Steve Zissou, for which he sang Brazilian covers of David Bowie material (and had an on-screen role). About his performance last night, my sitting-on-the-lawn-companion had a similar observation about the lack of vocal intimacy. Yes and no: as above I think it was more of the need for amplification in a large venue that may have done this. And Jorge tends to sing with more force than one might expect in traditional samba. But I found him to imbue his neo-sambas with almost a beat box percussive vocal style and orchestral timber ... to entertaining effect. My beverage choice last evening? I slummed it (again), eschewing noble beer for wine. More about this apostacy: NEXT. These mammatus storm clouds were dramatic but looked dangerous in Sterling, Virginia, last week. But there were absolutely no problems at all indoors at Sweetwater Tavern. The day I stopped by, Brewer Dean Lake was carbonating his Witbier. And before you say anything, yes, I have been heard to complain about the silly surfeit of spiced wheat beers that seem to swarm these days like mosquitoes on steamy summer days. But ... Dean is a talented brewer - past of Dominion and of Thoroughbreds - and this was a tasty one: lemon, cardamom (? ), and a whiff of sulfur all skillfully underplayed for a good thirst quencher. It may yet be on tap this week. Dean and I went out for a pint, meeting up with a past manager from the former Thoroughbreds, but I called it short when I saw the storm (in the photo up top) developing too quickly for my comfort! A tornado warning was broadcast, but fortunately one never materialized. Lots of hail though. Here's a good photograph of Brewer Dean Lake (on the left) and Bob Tupper - the dean of the local brewing scene - at the Brewers Ball in D.C. early March. A dram law holds an establishment - licensed to sell alcohol - liable for a patron who has been served alcohol there who then or later does something which results in destruction of property, personal injury, or death. These laws can penalize an establishment for serving alcohol to an obviously intoxicated patron or for the above serious situation. And those penalties can range from fines to revocation of the liquor license itself, which would effectively close down the business. Washington, D.C. does not have dram laws, per se. Recently I was at the 9:30 Club - in Washington, D.C., but one of the premier cutting-edge music performance venues of the East Coast and arguably of the U.S. - conducting Clipper City Brewing business. Afterwards, General Manager Jean Homza discussed with me and the representative from Clipper City's new D.C. distributor some of the challenges of conducting club business in D.C.
She was quite vociferous about the inconsistencies - she used stronger terms! - in some of the laws affecting alcohol-licensed establishments. For instance, in D.C., a club is prohibited from confiscating a faked identification (21 of course being the legal drinking age). Think about that: someone committing fraud is allowed to attempt to do so again. It's the establishment which is held liable if it doesn't notice that the identification has been falsified. Little to nothing, she said, is done by the D.C. authorities to prosecute users of fake IDs. My business takes me south these days, so I don't often have the opportunity to visit with my friend Wayne Mahaffey, owner of his eponymous pub. 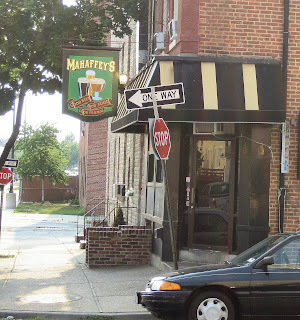 But yesterday I was in the Canton neighborhood of Baltimore, Maryland so I dropped in at Mahaffeys' Pub. And it felt like old times. As I told Wayne, his pub is a true local, something I haven't found closer to home in northern Virginia where there are good beer bars. But a local is - as I perceive it: a comfortably-sized tavern where different ages can commingle - not necessarily a pick up hot spot - and which offers above-average pub food and a creative good-beer selection. Owner Wayne Mahaffey is the new kid in town: his cozy pub is a gem in the Canton neighborhood of Baltimore, attracting a growing number of good beer fans along with his loyal locals. He and his staff are revivalists in the all-too-rare art of conversation and conviviality. Mahaffey's has 9 taps, a cask every Monday (a mix of regional and British), and a healthy, growing bottle list. There's a small but efficient kitchen and grill. Cask ale would be a plus when it comes to a local. And Mahaffey's has that. And since the above review was written, it's there now almost every day, depending upon availability. The pub has also expanded with an upstairs lounge (closed during the summer months) and has maintained and strengthened its good-beer reputation. This Geuze (Boone's spelling) is what I would consider a true lawn-mower beer: tart, woody, earthy, funky, and dry. It was a perfect antidote for the heat. I like places like Mahaffey's Pub and Growlers in Baltimore, where the people that run the places are really jazzed about beer, they're nuts about it. They really care about what they're selling. That comes through - the staff get it, and they care about the beer, too, sometimes fiercely. Wayne Mahaffey called Tom Cizauskas, the beer representative that had gotten him started on transforming his corner bar into a beer bar, and shouted"I did it, Tom! I got rid of Miller Lite! It's the last one, now it's all great beer!" He was as excited as if he'd won the Olympic medal. Wayne gets it. I would amend that: Wayne was well on his way to bringing in good beers before I even stepped foot in. And that call? It was at 3 in the morning! Wayne is a true publican, in the above "local" meaning of the word. He's there most every day, for at least several hours after he opens the pub at 4pm. If you have trouble finding Mahaffey's, look for the Canton Safeway and Saint Casimir's (with the golden onion-domes). It's between them at a right angle. It was at an in-store tasting, and I had just finished describing to a potential customer a technique Clipper City Brewing uses in brewing Loose Cannon Hop3 Ale. Our brewers strain hot wort through a hopback - an open vessel holding many pounds of whole leaf hops, literally steeping a hop tea. This imbues Loose Cannon with an herbaceous and fruity character, a flavor distinct from the grassiness of dry-hopping and utterly different from the bitterness of hops. It's what makes this strong pale ale unique. This all-too-common obsession with a number - one which most craft breweries do NOT determine in an accurate scientific fashion - misses the point. Bitterness is perceived in conjunction with the beer's sweetness or maltiness. Think of lemonade - too little lemon and it's too sweet, too much and it's too sour. Particularly intriguing was a conversation between two women who appeared to be just past the minimum age. They were standing in line, eagerly waiting to receive refills of Hop Devil Ale, an India Pale Ale, brewed in Pennsylvania by the Victory Brewing Company, that is big, bold, very bitter, and very aromatic. Too often, many of us refer only to bitterness when we talk of hop quality, as in the macho muscling in of as much 'hair-on-your-chest' bittering as possible. We forget about the appealing bouquet that hops impart to beer. Hops are herbs, after all. In cooking, spices such as allspice or cinnamon are thought of as sweet spices. They aren't sweet, per se, but, rather, confer a sweet character to the foods in which they used. Similarly, the aromatic character of hops lends a fruity, herbal character to a beer quite distinct from maltiness. Specific Gravity only captures one narrow aspect of "MALTY," just as IBUs only capture one narrow aspect of "HOPPY." Neither addresses FLAVOR. But, at this tasting, this particular customer would have none of it. So, I said, "It's 75 IBUs!" He turned and walked away. So I went to see Mr. Brooks. It was an above average movie that, with less Hollywood group-think, could have been a good movie. In his thrillers, Alfred Hitchcock seemed to ask us to willingly suspend our disbelief for a couple of hours ... and then he would reward us well for that effort. Here, however, there is a superfluous escaped convict subplot that does nothing but distract from the psychological thriller we are watching. There is a multi-millionaire tough cop. And then there is the gratuitous gore at the movie's conclusion - and I don't wish to be a plot spoiler here - that could have been a Hitchcockian moment without the blood: that is, would it happen or would it not? But Hollywoodism won out. Oh well. Even before the movie, I experienced a Catch 22 moment. I ordered my tickets on line to avoid waiting in line - there's a surcharge for the privilege. But not clearly stipulated, until one arrives at the movie theater, was that tickets for R-rated movies must be picked up at the counter ... standing in line! Albert C. Cizauskas, my father, was a lifelong appreciator of good books - the words in them and the binders that hold them. Consider contributing to a library of your choice. Read more about my father. 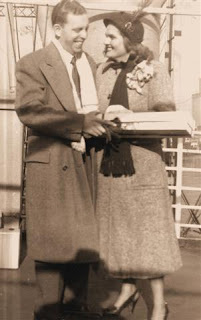 Dad and Mom in 1951. Steve Frank and Arnie Meltzer are the dynamic duo who write on beer as the Brews Brothers. 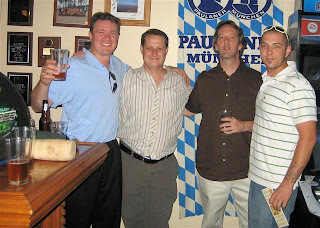 In April, I was invited to Arnie's house to taste Berliner Weisse as part of research for their now just printed article in Mid-Atlantic Brewing News (Vol 9., No.3, June/July 2007, pp. 10-11). I recently purchased another bottle of 1809 Berliner Weisse style; I agree with my original favorable impressions. I'm wondering, however, if the bottle is active, that is, if the yeast or other fermenting culture remains alive and fermenting in the bottle. The beer seemed even more tart than I remembered it to be - even more of a summer refresher. Recommended. "It may be because craft beer lovers are looking for something different" from the high-alcohol, overly hopped brews that seem to dominate the marketplace. That's a vigorous discussion for another day! And one that Brother (Lew) Bryson often addresses in his Session Beer Project. By the way, to read reviews I've posted on other beers: look to the navigation panel, go to "Bloviations ... by Category", and click on "beer review." Homebrewing became legal in 1979; Sierra Nevada opened in 1981. So it's been 26 years, a true coming of age for the industry and for its adherents. I'm part of the generation that experienced this rebirth of good beer in the mid to late 1980s. Now, there is a newer generation that has never NOT known good beer. Thus this good-beer-gen is different than its predecessor in an essential way. It enjoys beers for being good beers alone; whereas its elders hold tight onto their beers remembering what it had been like without flavorful brews. Both are valid viewpoints. In D.C., you'll find the good-beer-gen flocking to Birreria Paradiso, a cozy beer grotto beneath pizza parlor Pizzeria Paradiso in Georgetown. And this past Monday, chef/owner Ruth Gresser and Manager Greg Jasgur invited me there to co-host a Clipper City Beer Dinner. As you can see from the menu, "pizza parlor" is decidedly deficient when describing Pizzaria/Birreria Paradiso! Chef Gresser prepared several of the items with beer including the Mushroom Cap with the Uber Pils and the Salad Dressing with Oxford Raspberry Wheat. A key to cuisine de la bière is not to have food taste like beer but to use inherent qualities of the beer to enhance a dish. Thus the Small Craft Warning Uber Pils contributed a subtle spicy grassiness - a good foil for the salty Pecorino cheese in the mushroom cap. The Raspberry Wheat added a fruitiness to the salad dressing, similar to Balsamic vinegar, but without its bigger impact. Pairing a fruit beer with a salad prepared with the beer, however, is a common mistake. The taste of the beer in the glass disappears when confronted with the vinegar in the salad. Not committing this flavor faux pas, Gresser and Jasgur instead paired the citrus salad with the Hop3 Ale - a citrusy herbal I.P.A. The salad was tossed with olives and Mediterranean anchovies. With the beer, it was a surprising bit of gastronimical thaumaturgy. My beer dinner 3 days earlier at Easton, PA had featured every Heavy Seas beer, if from bottles. While not quite matching that inclusiveness, the dinner here at Birreria Paradiso featured several Heavy Seas beers on draft, and the Loose Cannon Hop3 Ale tapped from a cask. The Winter Storm, kegged in January, seemed now even hop-earthier and caramel-maltier than then. The English hops -- E.K. Goldings and Fuggles -- have an earthy character and even a hint of buttery oakiness not found in more aggressively resiny and piney US hops. Greg served the Peg Leg Imperial Stout with what is commonly referred to as Guinness Gas: 65% Nitrogen, 35% carbon dioxide. Originally developed by Guinness to imitate the natural cascading bubbles of cask ale, this mixture is now considered by many to be di riguer for dispensing stouts. Nitrogen is artificial to the brewing process but it was fun at the dinner, and the crowd liked it. The fruit, spice, and earthiness of Red Sky at Night Saison lent itself deliciously to Chef Gresser's dessert course of tiramisu of strawberry and goat cheese. Most beers should be consumed fresh. Like fine meals in a restaurant, they should be experienced just after they have been created. But there are some beers, such as barleywines, that can be cellared; they will change and develop over several years. Below Decks Barleywine was brewed mid-November 2006. At the dinner - 7 months old and tinged with a bit of cherry - it was a delicious mate for the fruity/chocolatey Biscotti. Afterwards, I sat with a veteran recently returned from Iraq. He was ebullient at being able to have good beer again. Talking with him reinvigorated me for what I merely do - sell beer. More photos from the dinner. The current issue (Vol 9., No.3, June/July 2007) of Mid-Atlantic Brewing News has a quote from me on page 45. I'm glad it was recorded and reported (by Greg Wiggins), because I had forgotten that I said it! The evening to add the 15,000th beer to their long list of tasting notes was organized by the Tuppers as a fundraiser for Washington, DC's Children's Hospital. There was the feeling of a celebrity roast in some of the anecdotes told, but that was mostly a self-immolation by Bob Tupper, as the area's beer community turned the tasting into a tribute to the couple and their effect on the mid-Atlantic beer scene. "If there are two people that have done more for local beer than Bob and Ellie Tupper, I don't know them," said Tom Cizauskas of Baltimore's Clipper City Brewing Co. in a typical comment. Here are my notes on other things said during that 4 April 2007 event. Sette Luna - meaning seventh moon) - is a cozy and creatively designed Italian bistro in Easton, PA: Italian food (of course), a well-designed wine list, and a surprisingly good beer list. I say "surprising", because many better restaurants seem to expend their creative juices on their menus and wine lists, and then put together their beer lists as mere afterthoughts. I exclude brewpubs and beer-centric pubs and restaurants from this generalization because of their very nature. If I hadn't known the pedigree here at Sette Luna, yes, I would have been surprised. But I did, and so, to contradict myself, I was not surprised at the care devoted here to the beer! I first met owner and General Manager Josh Palmer a couple of years ago when he was the General Manager of the Boulevard Wood Grill in Clarendon, Virginia. He had just begun to create a good beer draft list. I introduced him to Clipper City's roster of beers; he liked what he tasted and brought in several. Current bar manager Billy has continued the program. When an opportunity arose to rebuild an existing restaurant space in Easton - where his family resides - Josh took the opportunity. That was nearly two years ago. 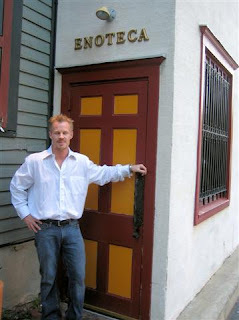 Since then he has expanded into the adjoining storefront and achieved community acclaim. He recently invited me to host the first ever beer dinner to be held at Sette Luna since its opening. And the occasion also happened to be only the second ever formal tasting/dinner anywhere of the complete line of Heavy Seas beers from Clipper City (the first having been at Royal Mile Pub in Wheaton, Maryland). As additional surprises, Josh had cellared the only two vintages of Below Decks Barleywine. And I brought a case of Clipper City's Hang Ten, our yet-to-be-released new summer seasonal, a 10% abv Weizen Dopplebock. It was the first public tasting anywhere of this beer, even before the next day's tour tasting at the brewery itself. 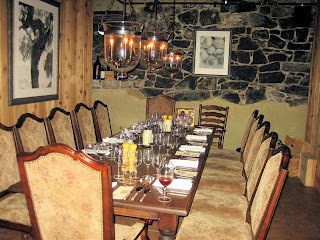 Reservations were limited so that the dinner could be held in the lower-level stone-clad wine cellar. 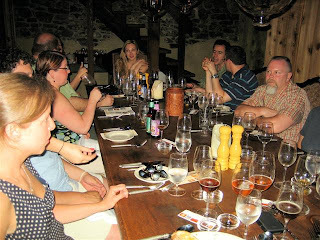 And so, all sixteen of us were seated at a gorgeous wooden table hewn in situ from a block of wood from a 200 year old Buck's County Pennsylvania barn. Special surprise: first ever public tasting of Hang Ten Weizen Dopplebock! During the evening, I discussed the beers and the brewery, while Josh discussed the food and the reasons for pairing. The food-spice nature of the saison nutured the goatiness of the Montrachet goat cheese. This is a delicious cheese that I recommend to you if you haven't yet tried it. The combination of the short-bread-like malt flavor of Euro-malts and the floral/spicy structure of Euro-hops complemented the similar flavors of the Italian cheeses (as it also does with Spanish sheeps milk cheeses such as Manchego). As a default, fairly tasteless N.AI.L.s often are paired with pizza, but usually simply as cold wet wash, rather than for any interesting flavor qualities. But with Winter Storm Imperial ESB, the caramel character of English malts melded into the flavor of tomato sauce; earthy English hops mated well with the earthy flavor of funghi. Mussels and Belgian beers have been a geographical gastronomical pairing for centuries. Why dispute? So, with the bivalves was our Holy Sheet Uber Abbey Ale (Westmalle yeast). Red wine is often used as a liquid for braising meats. But why not a a full-bodied darker beer? It brings toasted, roasted, and browned food flavors to the liquid - a natural for braising. Hence, Josh's kitchen did just that ... with Peg Leg Imperial Stout for lamb shank. Josh has plans to introduce this preparation as a menu item. Josh chose a creative pairing here. He thought of the beer's aggressive herbal and citrusy character as a palate cleanser, similar to sorbet. So he paired it simply with a citrusy salad of Arugula. It would do barleywine injustice to pigeonhole its flavors with any one pairing. Clipper City brewed its barleywine, Below Decks, with an acknowledged nod to English iterations. So think: chocolate! The food was exquisite, the pacing perfect, the room intimate: a wonderful evening. More photos here. The unintended marquee juxtaposition of two current-run movies. 'Pixed' to me by a friend in Baltimore. In January, I noted the demise of classical music on for-profit radio station WGMS-FM after more than half a century. But I also noted the simultaneous return of classical music to non-commecial WETA-FM (90.9 FM). In an article in the Business Section of today's Washington Post, Paul Farhi reports that that switch has been very successful for WETA-FM. Since switching away from an all-news/talk format, its ratings have doubled, and it has become the 5th most listened to radio station in a media-saturated D.C-area market. WETA-FM is bucking the national trend, Farhi reports, citing a National Endowment for the Arts study. In 2005, there were only 28 commercial stations with classical music formats, a number that is decreasing. And non-commercial stations themselves are reducing the amount of classical music (and jazz and other music) they air, in favor of news/talk programs. In an ironic twist, the format that the owners of WGMS chose over classical - George 104, classic pop hits - has since been abandoned. That's in less than 5 months! It's now Praise 104 - gospel music - and the station itself may be sold. On June 1, Clipper City Brewing began a year-long focus program to contribute a portion from every sale of all its bottled brands to a special fund for returning injured and disabled US veterans from Iraq and Afghanistan, in partnership with the U.S. Department of Veterans Affairs. Beginning June 1 2007 for every six pack of our beer that you buy, we make a donation to a fund assisting rehabilitation efforts for injured returning Iraq and Afghanistan veterans. Thank you for your support and for supporting our troops! When I attended the Siebel Institute in the early 1990s, one of my instructors was Walter Swistowitz, now deceased. Swiss, as he was affectionately known, had been hired by the US Army, as World War II was coming to a close, to rebuild German breweries ... in order to resupply the Allied troops with that invaluable resource - beer! I thought of Swiss recently. Contamination. That's bad. But remember, this is not a contamination that is ANY MANNER dangerous to health; at worst, it's one that produces an unpleasant taste. It's simply a matter of yeasts or bacteria (other than the yeast that the brewery deliberately utilizes to produce its beers) that have discovered a brewery's wonderful sugar source - malted barley - and, like unwanted guests, taken up residence. There are two types of breweries in the world. There are breweries that have had an infection. And there are those that will. So, I say - if indeed an infection occured - commendations to this local brewery for taking the proper ethical route and, in the bigger picture, the smarter - proactive - business route by dumping a bad batch, and by inference, noticing that there was a problem (which is, ironically, good quality control). PS. It wasn't Clipper City Brewing Company. There's plenty of Loose Cannon Hop3 Ale to go around! they are overbearing. Too much flavor. Too jammy. Too sweet-tasting. Too powerful. Too plush. They taste the same and they don’t go with food. If you are used to eating steaks slathered with ketchup, mayonnaise and all manner of secret sauce, an unadorned steak may seem devoid of flavor – until you get used to eating that way again and your taste buds recover their appreciation for subtlety and nuance. To put it another way, a marching band will always outblast a piano trio, and if you are accustomed only to marching bands, you may not appreciate the trio. That's from Eric Asimov's most recent blog about the trend toward high alcohol, high flavored California wines. Funny... he could be just as easily be writing about about Imperial/Extreme beers. When talking about Belgian restaurants in the D.C. area, I should also mention Mannequin Pis in Olney, Maryland, and Bistrot Belgique Gourmande in Occoquan, VA. The latter changed hands in 2001 when longtime owner Danièle Johnson sold the establishment. It is still open but I have not dined there in a few years. Mannequin Pis in Olney, Maryland, is named for the (in)famous statue in Brussels. The statue is as it appears: a small boy relieving himself. Pronounce it "pee"! The restaurant was opened and owned for several years by chef Bernard Dehaene, who, as well, sold last year. I have not been back since his departure, but reputable sources have told me that the new owners have indeed maintained Mannequin Pis' culinary and Belgian beer traditions. A beer dinner is scheduled for Tuesday 10 July at 7pm. Call 301-570-4800 for more information. Fresh beer is the best beer. Say it again: Fresh beer is the best beer. Once more: Fresh beer is the best beer. Beer tastes best when fresh. Yes, there are exceptions, but, being liquid bread, beer will be at its best when it's fresh from the vat. I have been preaching this since I made my first batch of home brew two decades ago, since I first stirred a mash professionally 15 years ago. And many others have been saying this for far longer, and far more eloquently, than me. 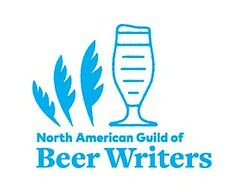 Now, I don't mean to single out the above beer pub, but I will hold some of the coterie of beer geeks to be culpable. Too often I'll hear some of them proclaim their fealty to good beer, yet watch them flit from new beer to new beer with scant regard for freshness but with maximum regard for the next newest thing, and, seemingly peevishly, especially if the beer is from somewhere other than here. And don't get me wrong. I'll enjoy a good Belgian beer as much as the next guy, or a wonderful craft beer from elsewhere. But let's support our local brewers as well. There, I feel better. I got it off my chest. 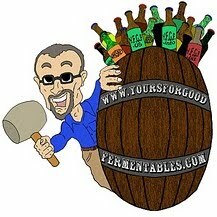 And, I will admit, happily, that I too am a beer geek. In the interest of transparency, I should also say that I am employed by the Clipper City Brewing Company, and so do have a financial stake in the local beer thing. Every year about this time the Brewers Association releases its statistical review of the craft beer industry from the year prior. The final tabulations for 2006 are now in. The craft beer industry grew 12+%. Imports were also up 12%, while mainstream beers, which had been down in 2005, were up 2%. The Top 3 Overall Brewing Companies were Anheuser-Busch, Miller, and Coors, with Boston Beer at the 5th position, Sierra Nevada at the 7th spot, and New Belgium 9th. Clipper City Brewing Company broke into the top 50 tier of craft brewers, achieving the 49th spot, with 14,600 barrels of beer sold. This comes from page 61, The New Brewer (Vol. 24, #3, May/June 2007). However, on the BA's website Clipper City does not appear in the top 50. It is Uinta Brewing which holds the 49th spot. The Top 50 list from the press release includes breweries that do not want their specific data listed. The list in The New Brewer has these do-not-publish breweries removed from the tables. Is there a legal definition of microbrewery?